Waterpod™ was a floating, sculptural, eco-habitat designed for the rising tides. It launched in the summer of 2009, navigate down the East River, explore the waters of New York Harbor, and docked at several Manhattan piers on the Hudson River before continuing onward. The Waterpod™ demonstrated future pathways for water -based innovations. As a sustainable, navigable living space, the Waterpod™ showcased the critical importance of the environment and art, serving as a model for new living, d.i.y. technologies, art, and dialogue. It illustrated positive interactions between communities: public and private; artistic and social; aquatic and terrestrial while exploring the cultural richness of New York's five boroughs and beyond. By visualizing the future, the Waterpod™ embodied self-sufficiency and resourcefulness, learning and curiosity, human expression and creative exploration. Through its dilatory, watery peregrinations, the Waterpod's intent is to prepare, inform, inspire, provoke, and fortify humanity for tomorrow's exterior explorations. The New York-based artist Mary Mattingly designed the project The Waterpod, an eco-floating habitat evoking the works of Buckminster Fuller, Andrea Zittel, Robert Smithson & Constant Niewenhuis. The Waterpod structure was built on a deck barge where systems were installed to generate food, water and energy. Four cabins were built for a group of resident artists and communal areas were built for the artists and visitors. The Waterpod was to be a free and participatory public space in the waterways of New York City, and represents an intervention and a gift from a team of artists, designers, builders, engineers, activists working with various groups, as well as companies participating "pro bono publico" or "for the public good". These contributors were brought together to create an environment that included both public resources and a private experiment, an aquatic and terrestrial, interior and exterior mobile hybrid. The platform moved throughout the five boroughs of New York and Governors Island between June and October 2009. In addition to the team that conducted the project, many artists from New York and elsewhere came to visit and contribute to its evolution. 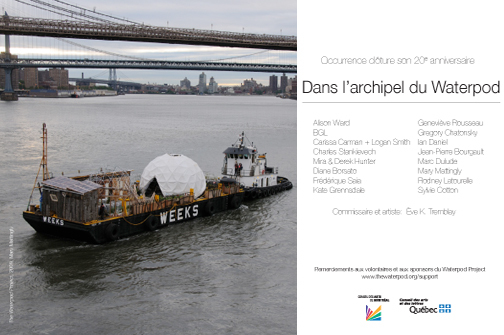 Occurrence has organized the visit of Canadian artists on the Waterpod in summer 2009 as we celebrate its 20th birthday. L’exposition se poursuit jusqu’au 16 octobre 2010. Bienvenue! In addition to the artist partners as part of the exhibition in the archipelago of Waterpod, the Waterpod project was made possible thanks to many individuals and organizations: Jean-Michel Ross, Lonny Grafman, Waterpod Advisor; Gabriel Krause, Lead Designer; Hendrik "Rik Van Hemmen, Waterpod Advisor; Tressie Word, Greywater System Designer for Waterpod. The New York City Office of the Mayor Special Projects, New York City Office of Citywide Events Coordination and Management, The Richard J. Massey Foundation for Arts and Sciences, The United States Coast Guard, the New York City Department of Parks and Recreation, The New York State Department of Parks and Recreation, The New York City Dockmaster Unit, Millers Launch, Weeks Marine, Frenkel & Co . Inc., Scarinci Hollenbeck, LLC, Alessi Organization, LTD Duraport Marine Terminals, LLC, Blank Rome, Robert Mann Gallery, Skybridge Capital, The Durst Organization, Canada Council for the Arts, Quebec Delegation in New York, McManimon & Scotland , LLC, Action Arts League, Martin, Ottaway, van Hemmen, and Dolan, Inc.., Haworth, Entero Energy Corporation, Avatar Que art center, and Numerous Other organizations and Individuals. 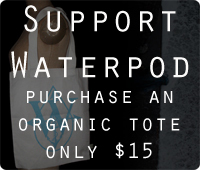 see: www.thewaterpod.org/support and the Council of Arts and Letters in Quebec and the Conseil des arts de Montréal for their financial support.